I was incredibly excited to see Icarus on Netflix, even before I knew what it was, because, hey, cycling movie! We don’t get nearly enough of those. And then I read the synopsis. And then an article in The Atlantic. Someone accidentally stumbled into the heart of the Russian doping scandal that almost got all of Russia banned from the Olympics? And it focused on the cycling? Awesome. Bryan’s first stop was Don Catlin, a prominent anti-doping scientist. Catlin happily talked about things, but didn’t want to get more involved, because his reputation had been so carefully built. So Catlin referred Bryanl to Grigori Rodchenkov. Grigori, a Russian doctor, headed an official anti-doping program – which meant he had a lab. He helped set up a doping program for Bryan that included testosterone and human growth hormone. Later, Bryan asked why Catlin had referred him to Grigori. Catlin talked very carefully around not outright saying it was because Grigori is wildly amoral. But that came soon after – Grigori was accused of being behind doping a ton of Russian Olympians. He was at first dismissive, talking about the World Anti-Doping Agency snooping around, but seemingly largely indifferent and a lot more excited to come visit Bryan in LA. Part of the reason for the trip was so that they could smuggle Bryan’s urine to Russia for testing. Grigori had special bottles. Special bottles specifically for smuggling urine. Parts of Icarus get a little surreal. They got through to the Haute Route and Bryan’s doped-up performance, cool music making it seem like a cross between an action movie and a heist. And this was before things even really hit the fan. Before Grigori decided to go to the US and expose the whole state-sponsored doping program and talk to the New York Times and the Department of Justice in the same week. 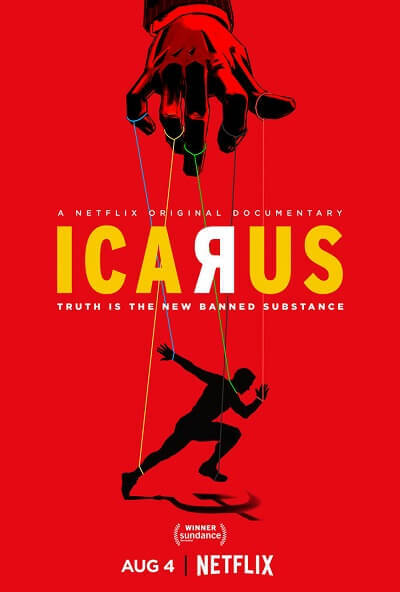 The cycling ends up falling out of the film a bit as they get deeper into scandal, but Icarus is still a fantastic confluence of luck, cycling, journalism and scandal that shows some of the human effort behind the 2016 Rio Olympic outrage.